When the air conditioning system in your home in Dallas, GA is in need of repair, maintenance or replacement, you can trust the honest, dependable professionals at Western Aire Heating and Cooling. We are a full service heating and air conditioning company and serving the communities west of Atlanta. For more than twenty-six years, we have proudly served the community of Dallas with fast, reliable and affordable heating and air conditioning repairs. If you trust us with the job of repairing the heating and cooling system in your home, you can expect prompt, courteous service and competitive prices. Western Aire Heating and Cooling employs a team of talented and hardworking HVAC professionals. Our professionals are highly trained to repair all different types and brands of air conditioning systems. To ensure that the job gets done right the first time, our experts will perform a diagnostic evaluation on your system, before starting any repairs. Our company is fully licensed, bonded and insured and we offer warranties on all of our repair jobs. You can give us a call today to obtain a free estimate or to get a second opinion. As an added benefit for our clients, we offer a free service call with every repair. We also offer annual maintenance agreements. If the air conditioning unit in your home cannot be repaired and needs to be replaced, we can help with this also. Our HVAC experts help our clients save money by offering the most energy efficient and techniques the industry has to offer. Whether you need air conditioning service, maintenance or replacement, we have what you need at prices you can afford. Our goal is to provide your family with courteous, expedient and professional service of the highest caliber. If you live in or around Dallas and are in need of air conditioning repairs, maintenance or replacement services, please give us a call today to speak to one or our HVAC experts. We look forward to serving you and to exceeding your expectations. 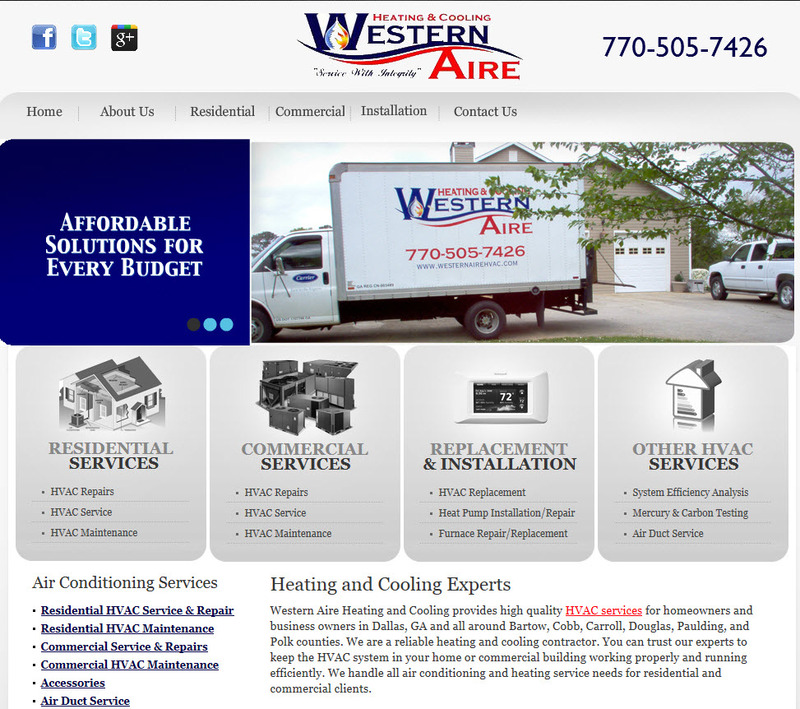 Western Aire Heating and Cooling serves clients in the West Atlanta area with top quality HVAC service, repair and installation at affordable prices.